Tuesdays start like Sundays, wake up, coffee, words, get up and tidy the bedroom and the kitchen. 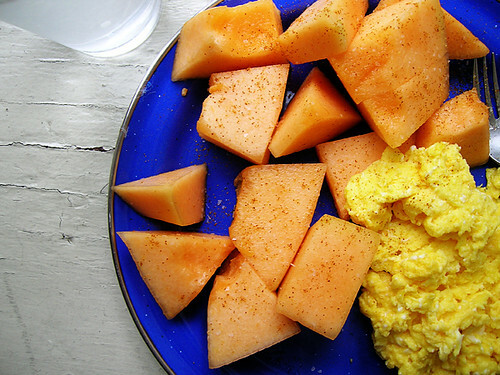 I still have watermelon jars in the fridge, but I'm standing here so whack whack whack some other melon, put three-quarters in three jars, plate the last quarter, and now instead of boiled eggs, I make scrambled eggs. VARIETY. Also put on a pot of water for turnip or mustard greens. By the time you put the meat on the back burner to simmer for twenty minutes, the water should be boiling for the greens. Dump the greens into the boiling water, blanch for a few minutes, and then drain and run cold water over them. Grab them by the handful and squeeze dry, then slice and dress with a little sesame oil, soy sauce, and rice wine vinegar right in their container. When the meat is done, put it into its container. The red pieces are beet greens, which I had extras of and just threw in. 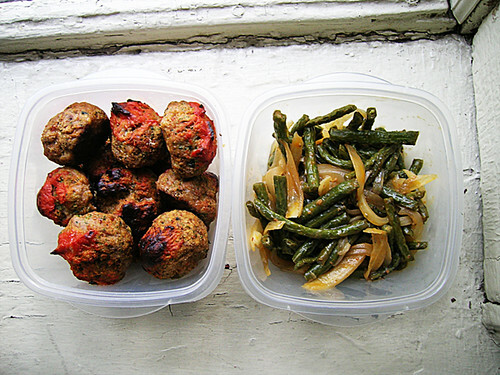 Now and again I make turkey meatballs, I like slow-cooked green beans with turkey meatballs as a change from greens. 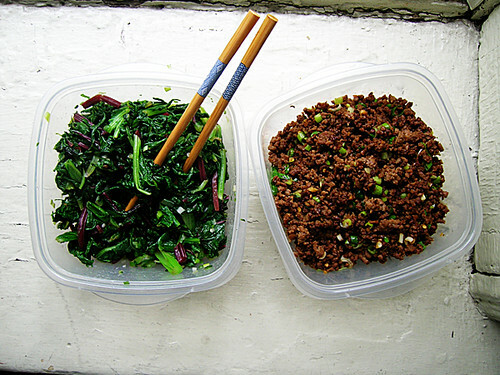 These are not slow-cooked green beans, though, these are leftover Mon Lung's Szechuan green beans, so even better. I do the end of week grocery list, whatever I need for fish tacos on Friday and a fresh batch of koldskal on Saturday. Peaches and koldskal for Tuesday lunch, too.